After nearly 1.5 years of whining about leaving San Diego, I can finally appreciate that it was a lucky move. While watching the news online, we've seen that our specific neighborhood was one of the first to be touched by fires. Astonished, via the news... we saw the intersection leading into our old neighborhood demolished by flames. Today, I have confirmed that our ENTIRE STREET was demolished. 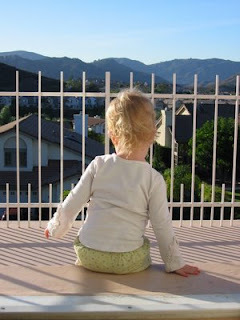 This picture is of Kenzie admiring the mountains of our second story deck & was taken just before we moved away. Battle Mountain is just off to the left, and not visible in this picture. This was Kenzie's first home. Suddenly, all my whines about leaving that home...have become an ENORMOUS sigh of relief. My thoughts are with our old friends that still resided in that neighborhood (but we've located safe), and the many others that have lost their homes. We've been watching the news ~ completely astonished. I get chills every time I see the damage that has been done. I just can't imagine what those families must be going through . . . 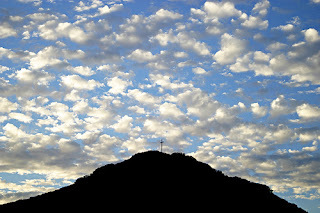 I went walking with a friend this morning who has good friends there too. She said they packed up and left and they don't know if their house is gone or not. What a shame. I'm glad you're not there either. I cannot imagine the stress and heartache those people are dealing with. Wow! That really brings it home to the heart, doesn't it? i've heard a little about the fire, but not too much. i didn't realize it was *that* much. Oh my gosh...I guess it was a lucky move. It's so sad to watch this happening. I keep thinking of all the people who've lost their homes or are about to, and all the wild animals who are stranded in those mountains. I have some friends in the Malibu area, but it looks like they're ok for the time being. What a tragedy. oh my. what an amazing thing fire is. i'll keep your friends and neighbors in my prayers. the pic is amazing in your previous post. drop me a line...we should do lunch..soon! I've been watching the news along with the rest of the country and can't even put into words what I'm feeling. I don't know anyone personally that lives there but I can only imagine the heartache and grief those families are going through - first to have to evacuate quickly and then to not know for certain if you will have anything to go home to. You must be so relieved that you moved - It's weird to watch on tv an area you are so familiar with being destroyed. (I life in MN and had the same eerie feeling when the bridge collapsed). Glad you are safe and we're praying for everyone affected by this fire. oh my. i'm also relieved that you aren't living there anymore! my brother-in-law and his family were evacuated out of escondido. so far their house is still standing. the devastation down there is so, so sad. i can't even comprehend it. We just watched the tv special on the fires last night. Isn't it amazing how things that you think are a mistake in life turn out to be the best blessing? Oh, that is so sad to hear. Glad your friends were found safe. We are praying. It's such a scary situation. I hope all of your old neighbors are OK. But I am glad you aren't having to go though that (not to wish it on someone else, but you know what I mean). How tragic. So glad you're safe but feeling for the many families who aren't. Wow. I just can't imagine. We are all so grateful to have homes. My heart is hurting for California.